Road salt is mixed by a front-end loader prior to loading onto public works trucks March 12 in Freeport, Maine. Budget-busting road salt prices are leaving local officials hoping for a mild winter. Salt supplies are tight on the heels of a harsh winter last year that depleted reserves. Prices localities paying now per ton vary widely based on the supplier, shipping costs and other factors. ALBANY, N.Y. — Budget-busting road salt prices are leaving municipal officials in the Snow Belt hoping for a mild winter. Salt supplies are tight on the heels of a harsh winter last year that depleted reserves, leaving many localities in the Northeast and Great Lakes to pay prices that range from about 5 percent higher to almost double. “Everybody’s got their fingers crossed for good weather,” said Rebecca Matsco, an official in western Pennsylvania’s Beaver County, where one contract price came in at $109 a ton, 95 percent higher than last year. The increases are frustrating to local officials who are locked into tight budgets. Some highway superintendents say they could choose to make their salt supplies last by mixing in more sand, which is cheaper. And others say it could force them to defer other road projects. But they can’t stop salting slick roads. “It doesn’t mean that we’re going to stop salting, it just means that it’s going to be more expensive to get these materials,” said Jack Cunningham, public works commissioner in the Albany, New York, suburb of Colonie, which is getting a relative bargain through a state contract of $62 a ton, a mere 5 percent increase from last year. Ohio’s Lake Township, which is paying about $90 a ton, says the good news is that it started the snow season with about 85 percent of what it needed in storage. That town’s road superintendent, Daniel Kamerer, says he also employs a technique to make the salt go further — moistening the salt with brine or other liquids to make it stick to the road rather than bouncing off. Orders can cover thousands of tons, and the prices localities paying now per ton vary widely based on the supplier, volume, shipping costs and other factors. Officials in snowy Syracuse, New York, for instance, report flat costs after extending a contract from last year. 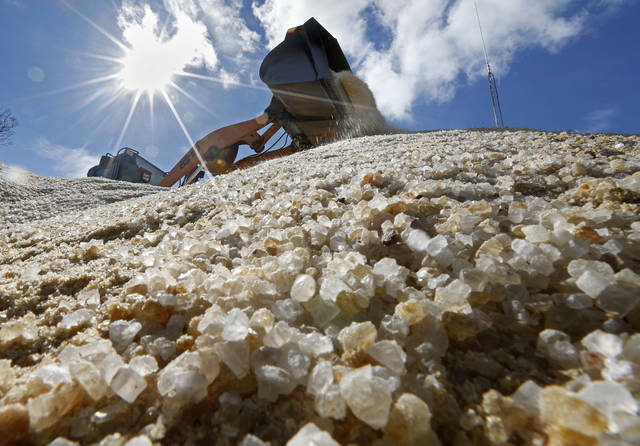 Production issues at two major North American salt mines have contributed to tight supplies. There also was an 11-week strike this year at the largest underground operating salt mine in the world, the Goderich mine under Lake Huron, off Ontario. Production slowed due to the strike but is now back up, said Tara Hefner, a spokeswoman for Compass Minerals. One bright spot: Snow belt towns might get their wish for an easier winter. The National Oceanic and Atmospheric Administration issued an outlook last month that said conditions could be warmer and drier this winter in parts of the North. Still, there have been a couple of early season storms already. Kamerer notes he had trucks out last week when an early-season storm that swept over the eastern United States.